The world’s largest and most prestigious film festival, Cannes, will soon be a destination for Teesside University Associate lecturer in Media Production and film producer Samm Haillay. 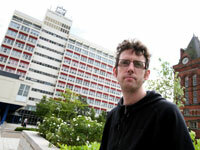 Teesside University Associate lecturer in Media Production and film producer Samm Haillay. This year’s Cannes will be held from 11 to 22 of May and Samm has been selected to take part in the ‘Producers on the move’ event. This was first initiated by the European Film Promotion (EFP) organisation 11 years ago, where 25 film producers from 25 European countries are picked annually to take part in a range of promotional activities. Samm is the UK’s sole representative, and was selected following a nomination from the British Council. During the ‘Producers on the move’ event, Samm will be involved in the following activities: > a press campaign including producer profiles and advertisements in major daily newspapers > a producers lunch for 180 European film producers > a round-table meeting/pitching session for all selected producers > production of a catalogue, poster and on-line presentation of participating producers. In addition to ‘Producers on the move’ a film produced by Samm, Cigarette at Night, has also been picked to take part in competition for Directors Fortnight. The five-minute short film, directed by Duane Hopkins, was part-funded by Teesside University’s Research Fund. The 2011 Cannes will be Samm’s eleventh, and the third time one of his produced films has been in competition. Samm, 37, said: 'Cannes is the most important festival there is. ‘Producers on the move’ is different as it focuses on promoting producer talent rather than writers, actors or directors. It is a rare treat to have a double reason to attend Cannes, with ‘Producers on the move’ and Cigarette at Night being in Director’s fortnight. I always come back from Cannes feeling buoyed, energetic and recharged. You get to see some brilliant world premieres on the big screen before everyone else. Everything I do outside of work informs my work at the University.